Free your mind and your voice will follow. 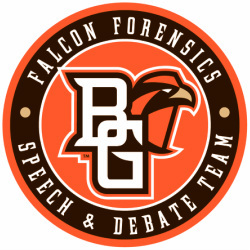 The Bowling Green State University Falcon Forensics Speech & Debate Program is a co-curricular, competitive team offered through the School of Media & Communication and Department of Communication to any BGSU undergraduate student in good academic standing. Students, with the help of an experienced coaching staff, prepare speeches, debates and interpretive performances, competing with similar students from other academic institutions. The activity is the collegiate level of speech contests and forensics teams offered in many high schools. Participants enroll in COMM1990 (or) COMM3990 “Forensics Activities” for academic credit and are eligible for Forensics & Debate Talent “Grant-in-Aid” Scholarships. The Falcon Forensics Speech & Debate Team fully supports the university vision statement, embracing the “interdependence of teaching, learning, scholarship and service through an academic environment grounded in intellectual discovery and guided by rational discourse and civility”. The program adheres to the core values of “mutual respect, cooperation, intellectual and spiritual growth, creative imaginings and pride in a job well done”. Further, the program supports the mission statement of the Department of Communication. Specifically, the BGSU Forensics, Speech & Debate Program is committed to promoting communicative, creative, performance and critical excellence through undergraduate intercollegiate forensics and debate activities within a supportive learning environment. What is Pi Kappa Delta? 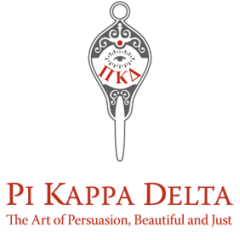 Pi Kappa Delta is a National Forensics and Communication Honorary established at BGSU in 1930 and is the oldest and most honored student organization at BGSU. PKD works in conjunction with the Falcon Forensics Team to provide a social/service forum, advocating communication involvement. ﻿"Connect with us to learn more about what BGSU and Falcon Forensics have to offer. Please feel free to send me a message below and I will personally respond as soon as possible. I look forward to hearing from you.﻿"
We can always be found by visiting the BGSU website. Help Falcon Forensics & Debate by donating to the team every time you use Goodsearch or Goodshop. Just add "BGSU Forensics" to the "Who do you search for? request and hit [verify] and you are off to helping support the team.